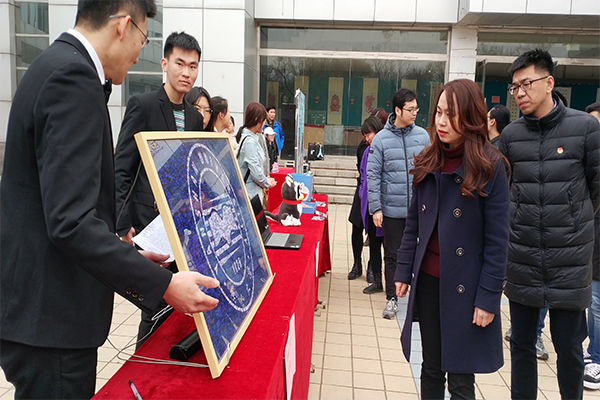 [News from the News Center] At 2:30 pm on March 28, the opening ceremony of the 15th YSU Club and Society Culture Exhibition Month was held in front of the East Campus Student Activity Center in the theme of “Demonstrating Club and Society Culture”. Li Xida, Secretary of Communist Youth League of YSU Committee, Zhang Yang, Deputy Secretary of Communist Youth League of YSU Committee, and School secretaries of Communist Youth League of YSU Committee attended the opening ceremony. Li Hui, chairman of the Association of clubs and societies, hosted the ceremony. The opening ceremony started in the song ‘Glory, the Chinese Communist Youth League”. Zhang Yang, speaking on behalf of the Youth League Committee, encouraged students to understand the connotation of Xi Jinping’s new era of socialism with Chinese characteristics and promote the construction of campus culture. He affirmed the achievements of the community culture construction in YSU, and gave the students some suggestions on improving publicity, strengthening community exchange; and exploring students’ potentials. Li Xida announced the opening of Club and Society Culture Exhibition Month and unveiled the opening picture together with the guests present. After the wonderful lion dance performance of the Wushu Club, the teachers and students attended the exhibition together. During the visit, the heads of the associations introduced the development history and characteristic activities of the club to the guests in succession. The calligraphy works, the Chinese studies, the martial arts projects among others attracted and engaged guests and students. The 15th Club and Society Culture Exhibition Month is hosted by the YSU Committee of the Communist Youth League and organized by the YSU Association of Clubs and Societies. It is a traditional event for YSU students. It is also a platform for young students to understand and interpret cultural innovations. It greatly enriches YSU campus culture.